I decided that if I was going to try using Adobe Illustrator for fashion design, I had better learn a bit about Illustrator first!Â So I took some time off from finishing Kodachrome and spent 2-3 hours with Illustrator instead.Â It was fun! and I’m planning to continue studying via online tutorials. 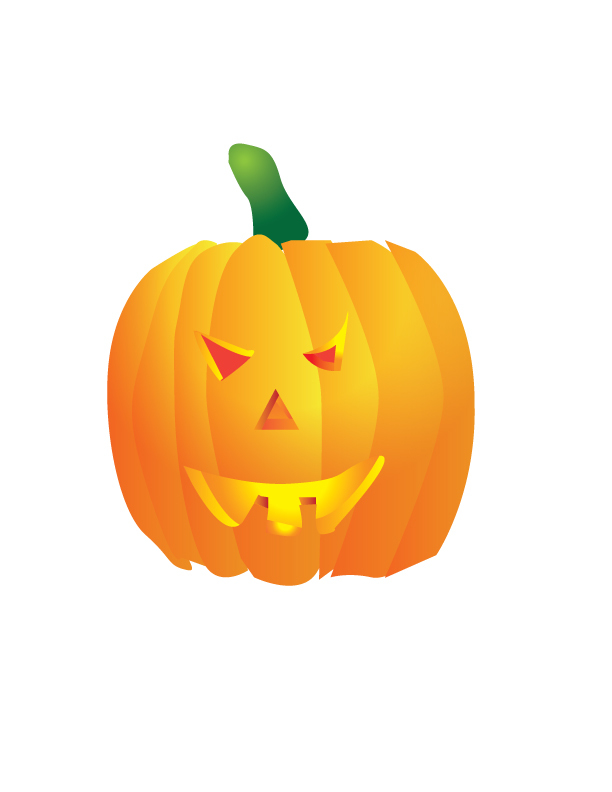 I actually started out with this great beginner’s tutorial, targeted at Photoshop users who want to learn Illustrator.Â It’s short but it taught me how to do the very basics, which prepared me for the pumpkin tutorial.Â I’m still not at the point of doing really complex work yet, but the pumpkin looks nice, no? In addition to learning Illustrator, I’ve also been practicing on the loom.Â After playing with things a bit, I’ve concluded that despite my modifications the CompuDobby IV will not keep up with my lightning-fast shed changes.Â So I need to slow down my treadling. Does that mean slowing down my weaving?Â Possibly, BUT! I think that by changing the order in which I do things, I can get a slower treadling pace without appreciably slowing down my weaving speed.Â Currently I change sheds, throw the shuttle, beat while closing the shed, and then open the shed at the same instant that I start moving the beater back.Â I believe that if I can adjust the motion so that I open the shed a trifle after I start moving the beater back, I can get the time the Compudobby needs without compromising weaving speed. This is, of course, easier said than done.Â The motions of weaving have become so automatic that changing the rhythm is very, very difficult – it’s like trying to change the way you swing your arms while you’re walking.Â Not only is it difficult to learn the new rhythm, I keep finding myself lapsing into the old method.Â But I am persevering.Â I have decided to weave in 20-30 minute sessions, 2-3 sessions per day, and quit as soon as I start having trouble keeping the new rhythms.Â Regular practice will help ingrain it into muscle memory. I haven’t been able to weave fast enough using this method (because it feels awkward and clumsy still) to test out my theory, but hope to get there in a couple more days.Â Meanwhile, I am weaving yards and yards of a 2/2 twill, which (while boring) will give me some base fabric to use for my dye experiments.Â This fabric is 20/2 white tencel warp woven with white alpaca weft of about the same size – which produces such a beautiful, fine fabric that it seems a shame to cut it up for dye samples.Â If I figure out what I’m doing before the end of the warp, I think I will use it for weaving a shawl or two. If you don’t have a Wacom tablet yet, I can’t recommend it highly enough. Most software nowadays can use the pressure and pen angle to do a great job of simulating a real pen. Especially since you’ve been training your hand, this might be a great addition to your arsenal.